Your pet has matured into a ferocious, incredibly powerful adult. With thick talons extending for several inches, an iron-like beak, and an impressive wingspan, this is a very formidable beast. It hunts for deer and other large game, as well as anything that threatens its territory. Gryphons love to play with each other, seeing who can fly the farthest, and other harmless entertainments. This fully grown gryphon is now strong enough to carry you as it flies, provided you are kind enough. Gryphons are noble and majestic creatures, and their eggs are not often come by. Gryphons nest high in mountains, and protect their young fiercely. If an egg is acquired, it was through permission and not theft. These creatures live for hundreds of years, and are wise, powerful beings. 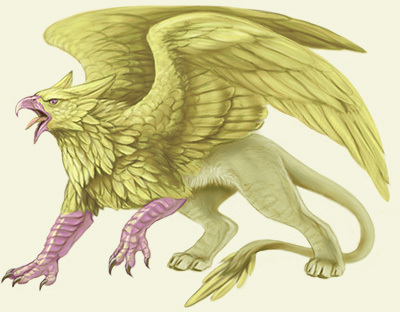 If a master is kind and loving enough, a gryphon may even allow them to ride it.